Happy Better Hearing and Speech Month! This post has been sort of percolating for a while and with Better Hearing and Speech Month’s focus on early intervention and the recent influx of new grads it seems relevant. Recently, while speaking with many of my SLP friends on twitter, some expressed distress that articulation norms are so often misunderstood or misused. I wanted to write a post about it a few weeks ago and prudence dictated I wait until I wasn’t quite so…frustrated. Then, a couple days ago, I had the distinct pleasure of reading a post on the way language milestones are often misunderstood. That post, from Teach me to Talk, is available here. I have to say, I honestly hadn’t considered how language milestones are interpreted…but it’s absolutely true they are misunderstood or maybe ignored much the way articulation norms are misused. But it really drove home how we tend to view milestones or normative charts not as how they were meant to be used – but how they best work in our favor. I recently had the joy (and it was fun) to help out at a kindergarten screening for a nearby town. The SLP in that town is experienced, knowledgeable, and competent. I was surprised to see how she interpreted the Iowa Nebraska norms that we use in our eligibility rubrics. (note: I have no data to show that her interpretation is harming or helping the kids.) When expressing my distress over this misunderstanding on twitter, I was reminded that it is not just this one SLP who misinterprets these norms. So, for the purpose of clarity here. This is the Iowa-Nebraska norms available in many places by googing “Iowa-Nebraska artic norms.” I retrieved this from our ND Guidelines that we use for eligibility for speech and language. When you look at this chart, it seems fairly straight forward. The ages on the chart are when 90% of kids produce the sound correctly. Now, I have some issues with this chart in and of itself. I’ve blogged before about how it compiled information and is wrong…BUT, for better or worse, it’s the “norms” we’re stuck with using. For the record, different charts have /s/ and /r/ as developed in the majority of kids by age 4 but that’s a different rant. When you look at the left side of the chart – you can see that /s/ is listed as developed at age 7 and /r/ is listed as age 8. On the right hand side of this chart, there is a breakdown of “word-initial clusters.” You can see that /sp, st, sk, sm, sn, sw, sl/ are all listed as the age of acquisition to be 7 years. While /r/ blends /pr, br, tr, dr, kr, gr, fr/ are listed as developed at…you guessed it…age 8. This chart, in and of itself, does not mention WHY it talks about /s/ blends and /r/ blends as developed at those ages, but it’s not a big leap to figure out it’s because that’s when /s/ and /r/ are developed (according to them). That means that the child should be able to produce a true /s/ (no lisp) in a blend at age 7. It does NOT mean that it is perfectly okay for a child to not have clusters until age 7.
cluster reduction, simplification, or deletion is age appropriate until age 7. It simply means the child may have a frontal lisp or an /r/ distortion in blends until that age (which is a no brainer because we’re not going to expect perfect in blends before we have them in singletons). This chart is ALSO in the ND guidelines (I believe it’s taken from the Kahn Lewis information and possibly from Barbara Hodson’s book). 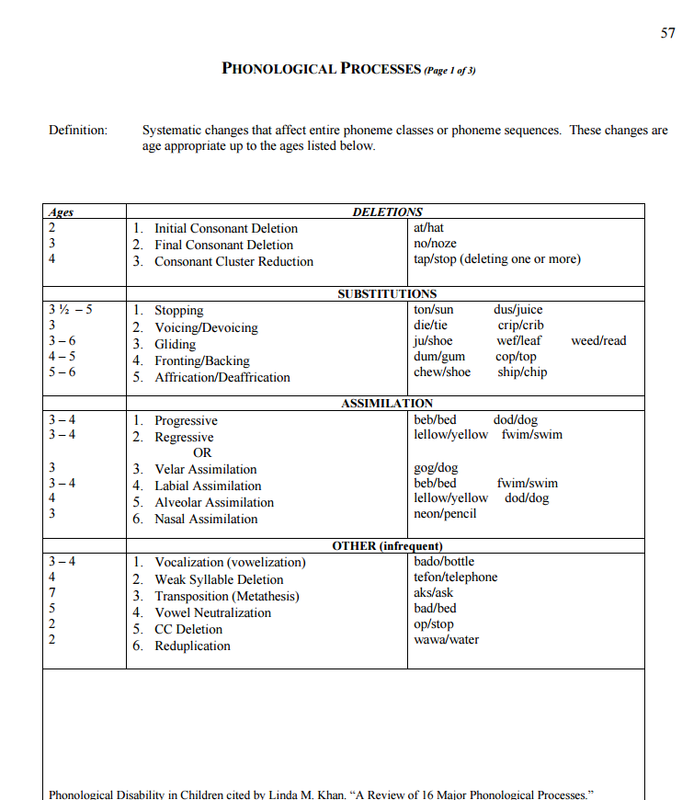 This chart lists when phonological processes should be eliminated. If you look closely, you will see that Consonant Cluster Reduction (top for stop) should be eliminated by age 4 and gliding (weed for read) should be eliminated by age 3-6. So, in other words, when a child presents with a cluster reduction /top/ for /stop/ or /sop/ for /stop/ at age 5 this is an ERROR and is no longer developmental. By the same token, if the child presents with /bed/ for “bread” this also is an error and should be eliminated by age 4…where if they say /bwed/ for “bread” this could be considered typical until age 6. Cluster reduction is the OMISSION of one of the two sounds in a cluster. Omissions are ALWAYS bad and affect intelligibility (that’s pretty simple but true). When we were doing screenings, the SLP (who was in charge as it was her caseload she was dealing with) considered cluster reduction to be developmentally appropriate for 5 and 6 year olds and would not consider them as candidates to be rescreened, tested, or seen for speech until that time. Conversely, she was very concerned when kids did not have “sh” and “ch” by age 5 and those students warranted rescreening and possible testing (which is weird because the norms have those sounds as in by age 6). When I was discussing my confusion on twitter…(you know, when you have those moments where you wonder if maybe YOU’RE the one who is wrong)…I was reminded that many SLPs misinterpret the norms. I have no idea if this SLP misread the norms because she truly misread them (I’d like to believe this) or because she didn’t want to have those additional students potentially on her caseload. I have no idea what her caseload looks like although I can imagine that it’s fairly large given the size of the school. I know many SLPs refuse to adjust how they read the norms because it would potentially inflate their already over-large caseloads. I’m surprised more SLPs don’t see that treating sound disorders early is key. Like all early intervention, if we hit it early and hit it hard, prognosis is better. I have to give a massive shout out to my professors at Minot State University because they absolutely drilled HOW to read norms into us until I’m fairly sure we could all recite them in our sleep. have 50 words or more by 18 months. know over 1000 words by age 3. My concern is that I already hear SLPs say “I don’t work on articulation in the schools” or “I don’t’ work on /r/ or /s/ until at least age 9 it’s not developmental until age 8 anyway.” Will I start hearing SLPs say kids don’t need language until age 3 or It’s developmental for your kid to only have 20 words when they start preschool. I am concerned that this is the direction we’re heading. I think the question I’m afraid to ask is how many SLPs would change their practices if they read the norms correctly…or how many would be unwilling to because of the additional workload. The other question I have is where do ethics fall into it. Not just the code of ethics (although I suspect that could already be called into question)…but our personal ethics. Nope…I’m not asking. I’m pretty sure the answers will sadden me. Hmmm. This post seems to have taken a negative turn and that was not the intent. So…In order to lighten things up a bit…and reward for reading all the way to the end. Please leave a comment here about milestones OR an anecdote about one of your students (with names removed of course). On 5/17/15 at 9:00 PM central time, I will announce a winner. The lucky winner will will a code for their choice of one of my apps (yes, that’s a shamelss plug but you have 5 to choose from and can always gift it to someone else if you happen to have all 5 already). Hi Mary, thanks for the post it made me think. I used the norms from the DEAP. Rhiannan isn’t the best name for an SLT / SLP and the kiddies with speech difficulties really struggle. But when they get it (like one little boy did on Thursday) we’re both super happy! I have parents who don’t always understand what milestones or sound productions are appropriate. Some will ask me why doesn’t their 5 year old make the /r/ sounds right and they want me to work on that. I don’t say that I won’t do it, but gently explain that the sound usually doesn’t develop until later. Most are happy with that explanation. Thanks for replying Ann. I agree, parents don’t typically read the milestones correctly. It is up to us to give them the correct information. 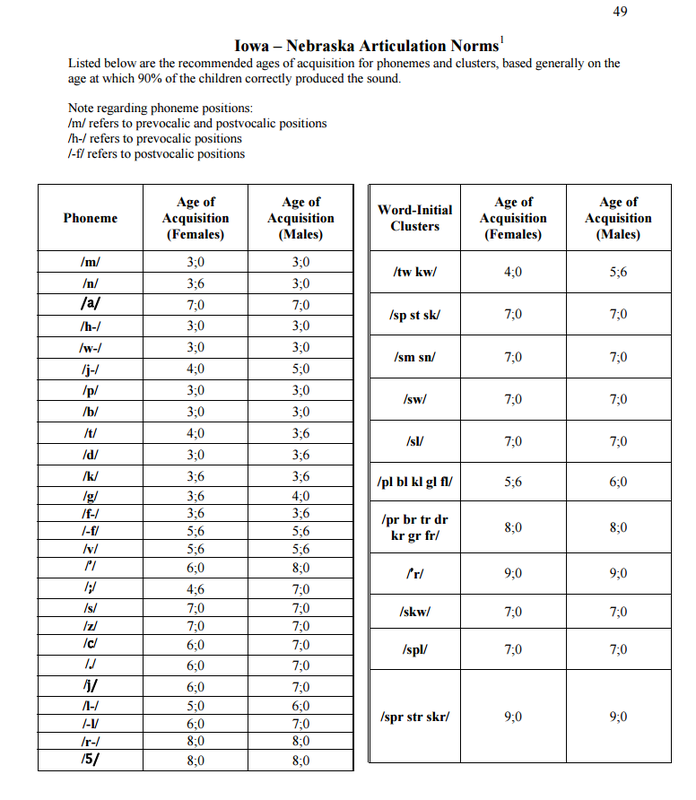 I’m really glad that my state has the phono guidelines – and we have different rubrics for preschool vs school age which is wonderful…But only if people actually USE them the way their intended. In my district, we seem to follow intelligibility guidelines more than we look at percentiles on the GFTA2. In fact, I think that overall our SLPs are overqualifying children whose errors truly don’t warrant pulling them from curriculum to work on later-developing sounds. It is common to see 4 year olds with a percentile of 25 on the GFTA2 and intelligibility of 98% qualify. While ii recognize that norms are often misinterpreted and misused, I feel that there should be a balance of using norms and professional judgment because on one hand we don’t want to miss children who need help, but on the other- we don’t want to provide services to chosen who are just in the natural process of acquiring their sounds. Agreed. I think there’s a bit of room for interpretation. I also think that there’s many times that there’s not a lot of in-depth thought. For instance, this particular SLP I was referring to thinks /s/ isn’t in until 7…okay… But when the sound is gone completely – is it the same thing as having a frontal lisp…or even a lateral lisp. With a lateral lisp the sound is still marked. The listener may wonder about sound quality – but he’s hearing the sound. I completely agree there should be a balance of using norms and professional judgement – and I’m really glad that the ND rubric allows us some leeway with that…but it also gives SLPs the responsibility to make informed decisions…not just quick decisions. Thank you for the thoughtful response. I appreciated reading it. Great post Mary. I’ve always been lucky enough to work in places that have allowed me to use my interpretation of needs, eligibility requirements, and clinical judgment in determining my caseload. I’m about to start traveling now, and it is a big fear of mine that the new places I work won’t be so liberal. This post and your last post on norms really helped to clarify what I’ve thought about interpreting norms. Articulation and phonological skills need to be looked at as separate but related entities. Same goes for the student with poor phonological awareness yet intact articulation. Phonology is a component of language, and of course, it needs to be assessed and treated. Unfortunately, it is not uncommon to hear of SLP’s turning kids away that need services (let the reading teacher handle it, a lisp doesn’t impact academics, the distorted /r/ is fine), and it always makes me feel angry and sad to know a child is being denied help. I don’t often comment, but I sure do love all of your blog posts !! Please continue on with all advocacy efforts, as I believe are making a difference where it is very much needed. Thank you for the kind words. I hope you enjoy the travel. It will definitely be interesting to see how districts do things so differently. I think, maybe, some of the difficulty that some have in remembering the language component that a sound system disorder may encompass. My kiddos are usually working on producing any speech/language at all, so I don’t usually do artic/phono, but in the severe (and bilingual) population, when it does come up, it’s full of interesting challenges. I was trained to focus on the early/middle/late eight, since most charts with strict cutoffs tend to confuse parents (and therapists, apparently). As I’m working with kids who are just beginning to develop words, I have to keep in mind that the early/middle/late sounds are, of course, not the same in Spanish. /m/ is good for both, /b/ not so much. I love how my job keeps me on my toes! Thanks for the response! I agree, we also have to take into consideration those cultural/dialectical differences for both language and articulation. Thanks for the link Brian. I know we’ve had the discussion on twitter a few times about sound acquisition and which sound (or class of sounds) is acquired in which order. Not all languages have the same order of acquisition and it’s important to consider that when we’re dealing with multi-lingual clients. It’s particularly important when we look at caseloads and realize that many multi-lingual students are being seen by monolingual therapists who may or may not be aware of the differences. This is very true and disturbing to think of slps not picking up kids due to misunderstanding the charts. I am finishing my first year for the schools and pick up kiddos that have that r or lisp early bc I’m a believer of early intervention. The longer they mis-articulate it the harder it will be to change!!! That’s been my experience too. I’d rather have them in earlier and out sooner than have them practice for way too long saying it the “Old” way…old habits are hard to break! We have a few school district SLP’s and assistants who scoff that our practice works on some of the phonemes (especially /r/) before those misunderstood ages. One told several of our parents,”they can stand on their heads working on /r/ with so and so but he’s not going to get it until he is 8.” Sigh. Thanks for the post. It’s always good to have a refresher on use of milestones. i am lucky to work in a setting that allows me to use professional judgement. I also would rather try and treat a sound earlier than wait until they have been mispronouncing it for six years. I also personally don’t use the GFTA-2 norms. I find it under diagnoses which is hard to explain to parents. Thanks for the article. I worked in a preschool where we read the norms to allow us to target clusters and frontal placement of /s/ at the same time because although /s/ doesn’t come until later, the consonant clusters were already missing, so we addressed them together. Progression looked a little like marking both sounds, correcting placement of /s/, then producing /s/ with correct placement in the consonant cluster. Also, my kinders and first graders are learning to read and if they cannot mark both sounds in a consonant cluster when speaking odds are they won’t when reading or when spelling. Not being able to articulate clusters at this age ha a negative impact on their reading fluency. This could be a rant for another time. And I would be happy to discuss reading development and articulation/phonology. I am always looking for additional tools. I absolutely agree Melissa. As I tell people when I lecture on Cycles theory, it’s not necessarily a perfect /s/ (although we try), but it’s marking the sound that we’re working on. It makes a huge difference in their reading and spelling. The same as someone who substitutes a “th” for all fricatives. That goes beyond a frontal lisp and needs help sooner rather than later. Thank you for sharing. I personally struggle with the large gap in the norms on artic test and the standards used in my state. Do the standards not take into consideration the “norms”? Would you work on sounds earlier if you could or later? Mary: Those are great questions. It’s also critical to understand that these age milestones are based on *group* data which obscure individual variation. That is, the “standard deviation” around those milestones needs to be considered as well. Too often, we treat milestones as binary when in fact they represent something of a continuum. Thanks for the comments Brian. For the sake of the readers here, will you give an example of reading the milestones and inferring the SD – and maybe how someone trying to figure it out on their own would be able to do so? I’m thinking of the SLP who wants to make those informed eligibility choices and may have to make an argument for/against eligibility. Thanks for the reminder and clarification. I’ll have a grad student next year and plan to keep this information close by. I am Somewhat guilty but strict guidelines often hinder eligibility. Using professional judgement and having this info to use as a basis for the argument to provide therapy will help. I’ve found, with our ND guidelines, it’s really a matter of how they are interpreted. For instance, a kiddo who is 5 that has an /s/ issue isn’t going to qualify (typically)…but if a kid who is 5 has cluster reduction they would qualify. I think, perhaps, the SLP I worked with wasn’t attending to the fact that this wasn’t an articulation error but a phonological process error – those kids would have qualified for services if using a phonology guidelines instead of an artic guidelines. Looking at all the variability is important to really see the whole picture. Thanks for the reminders on milestones. It’s always good for those of us who have been doing this for a while. Sometimes the state guidelines keep our hands tied as far as who we can see and who we can’t see. I am fortunate that the system I work in has allowed the SLPs in the county to create a system eligibility guideline for the speech/language program here. All therapists wanted consistency in how students were determined to be eligible for services across the county. We have guidelines that we follow for all speech/language areas, not just artic. We all had a chance to provide input so there would be a consensus. It has worked very well for us. Thank you for the great discussion! In Iowa we use RTI (response to intervention) in qualifying students for services. This relates to their stimulability for correct production. If they are ready to work on R in first grade, I have no problem with targeting that sound. If they are frustrated, and unable to produce the S in a blend, I will wait. Of course, there are other factors to consider as in parent/teacher input. I’d love to hear more about how you use RTI for qualifying speech and language services. We are moving toward doing that as well – but RTI Tier 1 is supposed to be from the general classroom teacher and they typically don’t feel comfortable doing it for speech – at least here. If I’m going to work with them, I want them addressed on my workload in some way so they are accounted for. I’m always interested in seeing what others are doing and changing things up. Thanks for posting! I’m also in Iowa and use RtI as part of my daily job and determination for services. I would not hold off on a student who was frustrated, but instead would move forward because my Tiered support shows that tier 1 did not work (gen Ed teacher wasn’t successful in their intervention), and that Tiered 2 probably did not give me the rate of progress I would expect (student is not stimulable, gets frustrated, etc). The students I work with do benefit from gen Ed interventions from the classroom teacher so don’t shy away from education-my interventions are often 5 min daily with data taken only 1 time per week. Many students who are stimulable just need that ‘push’ from their gen Ed teacher. Not to mention, once the teacher takes ownership, the student progresses faster with carryover outside the speech room. I also find associates are a great asset when available to carry out this intervention. 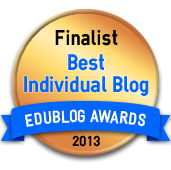 This time in the beginning often saves a student from needing speech services. Also, all that data helps qualify those students who do not make substantial progress. Tiered 2 is a bit trickier for time management, but it’s also a good piece of the puzzle. My only complaint is my ‘workload’ from those interventions do not count toward my total ‘caseload’- my supervisor truly does not understand that during discussions that workload is what number we should be looking at, not who’s on my roster. Thank you for your thoughts. What is the difference, in your opinion, between an academic impact and an educational impact. If the student participates in class – but isn’t allowed to be in the school play because of an /r/ error – is that an educational impact? That happens, it was discussed on the ASHA school-based SLPs community. I think we need to look at the whole student – and all the areas of education, not just grades and speaking up in class. What about how others respond to him – what are his job prospects? When he applies to college – will it be noted there? Not everyone has access to private practice and those students who can’t access it, are we dooming them to a life of R errors? What are their potential job aspects? I agree, kids shouldn’t be unnecessarily pulled from curriculum…but I think I may disagree on what is considered necessary. With 5 or 10 minute articulation drills and differentiated instruction in the classroom it is entirely possible for the students to have full access to their curriculum AND have remediated articulation. I do appreciate your views and they definitely provide food for thought. Thank you. I agree. Let’s avoid any “extreme” positions and consider the whole child in the larger community. If a student was being teased or mistreated by others at school due to an articulation error that most certainly impacts a child’s educational performance as they may begin to shut down in the classroom. I do not feel we can enroll students simply because they don’t have access to private therapy. In my opinion that would be like qualifying a child for a learning disability because parents can’t afford a tutor and the child won’t get extra help. I also don’t feel I can judge an adults ability to get a job based on elementary speech errors. Again, in my opinion, that’s trying to find reasons to enroll them based on what may happen and not on current levels of performance. I believe school based guidelines should be put in place for SLPs so we can appropriately provide services to those students affected in the school environment and not have 100 kids we don’t have the ability to treat effectively. Out OTs and PTs have specific school based criteria they follow and no one seems to disagree but suddenly if an SLP doesn’t see every student with any kind of error we are in the wrong. There is a reason there are a variety of service delivery models…school based, private, etc. I do think SLPs have always thought we should treat all the kiddos but the more read our guidelines I think it makes sense. Again, I will compare it to the school psychologist who has specific criteria to follow to find a student eligible. If they found every student eligible because there was a slight academic delay our school would be over run with IEPs. I have been in conferences where we don’t find them eligible and it makes sense. It has to have a negative impact upon their educational performance and if the teachers and I cannot document that as a team we don’t find them eligible….and I don’t just mean grades. This is a great discussion and I think it is important to hear all the opinions. Please dnt read any negatice tone in this. Just my food for thought and how my administrators expect my program to function. With these guidelines I still sit at 76 kids so I can only imagine if we didn’t have any! I agree there do need to be guidelines. I don’t see qualify all kids either…but if a kid still has a pervasive /r/ error in 3rd grade – I’m more than likely going to see them because it won’t remediate itself if it hasn’t by then. I agree also, that lack of funding for private therapy doesn’t automatically make a kid eligible…but I have a real issue with passing them off to private therapy as well. If they need private therapy – then they need me. Wouldn’t it be nice if we could have the ideal world where all the kids that need help get it – and administration recognized the benefit that our help gives and actually supplied schools with enough SLPs to be effective and not over-worked? With 76 as your caseload, I can’t find fault in your rationale…but I am extremely grateful that I don’t have those numbers. Thanks for commenting! I agree with what you are saying. I wish our state had a phonological process norm rubric. While we don’t have one I work with preschoolers and use one to guide my decision. It needs to be a case by case decision with not only formalized scores being used but also are they stimulable, how much is intelligibility affected, etc. Really interesting read. We are not told to use any particular articulation or phonological process norm chart in my district, which causes a lot of issues. Not only are we all using different norms (there are over 100 SLPs in our system! ), but I imagine everyone interprets them differently (or even incorrectly, as in your experience!). It’s beyond frustrating when I get a 4 year old transfer from another school in my district who is working on ‘sh’ and ‘ch’! I thought everyone knew how to read the articulation norms and understood the language milestones until I read your article. I am thankful for my instructors and the fact we learned the correct interpretations. I follow the Medicaid guidelines for NC and there are separate guidelines for artic/phonology. Our local school district does not like when I have CCR goals for preschoolers, but it make such a large difference in intelligibility. I wonder why they wouldn’t like it – it does make such a huge impact on intelligibility and on later reading/spelling. Thank you for posting this! Unlike many other posters, I was NOT taught much about milestones in grad school and I do sometimes forgot about phonological norms and refer mostly to articulation norms. However, I do tend to work with students in 1st grade (and a few in kindergarten) whose errors are impacting their early reading skills. They are not technically on my caseload; I see them through RTI. I am the only SLP in my district, so there are no other rubrics or guidelines for when to work on sound errors and our state guidelines are pretty broad. What rubrics are other posters referring to? Are these rubrics available online, or are they only for SLPs in your school district? Thank you so much for clarifying the norms for those of us who were a little confused and needed a refresher! I’m curious as to see how early other SLPs (who believe in early intervention of sounds & not waiting for them to qualify at a certain age) work on certain sounds like /th/, /r/, and frontal /s/. Thanks for the response. The rubrics I refer to are the ND state guidelines for eligibility. Some states also have guidelines. There are several different sets of norms out there – many that conflict with each other. In an earlier post (one I did last year I think), I pointed out that some articulation norms have /r developed at age 4 while others have /p/ not due in until age 7. It’s crazy how variable it is. I think (but could be wrong) that the most commonly referred to norms are the Iowa/Nebraska norms and the Sanders norms. With both of those, they’re misread because people tend to look at the Right hand side of the norm chart and forget about the left hand side when the sounds actually start developing. Thanks for sharing this. Can you share your thoughts on ages for prevocalic r development and vocalic r? Thanks! Thanks for commenting Alecia. Working on /r/ is sort of a hot bed of contention…for some reason /r/ and /s/ appear to be the ones everyone likes to put off as long as possible. Personally, it truly depends on the student. There are some kids, I work on prevocalic /r/ very early – 4 or so…if the child displays numerous phonological processes – working on suppressing the gliding tendency for /r/ and /l/ early on has positive benefits. According to our ND guidlines, Gliding should be eliminated between ages 3-6. So if the ONLY error was /r/, I wouldn’t work on it until 6-7, but if the child has other processes, I work on prevocalic /r/ and /r/ blends as early as 4-5. If you read the articulation norms (Sanders 1972), 50% of children produce /r/ correctly by age 3 with 90% producing /r/ correctly by age 7. “That we seem to be holding a child with a speech sound disorder to a HIGHER standard than other children. By this I mean, why are we enrolling children in therapy only when at least90% of their peers are producing the sound correctly? If, the reading specialist refused to help a student learn how to decode words to BEGIN learning how to read until 90% of their peers had already mastered reading – would we find that acceptable? I personally, find it difficult to explain why I wouldn’t help a student with /r/ until they are 9-10. I’d rather get them in early and get them done before I have to retrain years of bad habits and misinformation. Hi Mary! Thank you for sharing this! I was just writing an email to my employees about this VERY issue. Now that I am working in EI, I see the incredible opportunity to intervene early (ha ha) for sound development. Many states, thankfully not mine, do not allow therapists to focus on sounds at all in EI. Given we are the ONLY ones that are able to effectively work on this area, it seems ridiculous to me that the state government making these decisions believe their sounds are going to magically correct at age three when in reality, it only puts them further behind in speech (and reading and socialization and school readiness and…..). When I worked in the schools, I used to think “What could I have done for you IF I had you earlier than Kindergarten?” By targeting the early sounds in CV structures at the 1, 2, and 3 syllable reduplicated level, I have seen MAJOR improvements in not only speech, but language too! So many of our kids are expressively delayed, but a lot of SLP’s have been told to or only want to work on language. Without speech and sounds there is no expressive language. In addition, if no one understands them, what’s the point? I work hard to educate those in the field through my workshops that early intervention should apply to sounds too because expressive language and speech are not mutually exclusive. Thanks for commenting Dawn. Nice to see you here. I’m thankful that I can see those kids from 3-5. It’s frustrating hearing that others can’t. I work for Broward County Schools, and we follow the norms of the old Arizona. I’m not sure why they don’t use the GFTA 2 since that’s what we use to test for Artic (until 3rd ed. In Fall is released). However, intelligibility and academic impact are the driving factor for eligibility in our district. So last spring I was walking down the hall and the PreK kids were walking to lunch. Some were on my caseload and would say hi to me. I said hi to one who I always waved to me but I didn’t know his name. He told me his name and I knew immediately that he needed to be tested. He was practically unintelligible. I had a meeting practically the last day of school to get consent from parent. She was so happy that finally he was going to get tested. He was receiving services under the Developmentally Delayed program. I’m not quite sure why the teacher, who sees me every day, did not bring his speech errors to my attention. Well fast forward one year. Nathan is now producing his velars in the initial position of words, stridents and s-clusters. He still has many errors in spontaneous speech but his intelligibility has significantly improved. We just had his annual meeting and his mom was so happy with his progress. Makes you feel great! Lived your bog post. Glad you were able to start seeing him! Thank you for sharing. Congratulations to Smiley1SLP! You are the winner of your choice of one my apps. You can look on the My APPs page to see which apps they are and a little bit about them! Once again, another great post, Mary. Love your stuff!!! I worked on R with a preschooler. He was stimulable for it and it was in his first and last name. Sometimes norms get thrown out the window.